A note from Daisy: This post is a first for me and this blog: I have never had a guest writer before and am pleased to present one today. You may know Brie from her comments here and on other perfume blogs. When she isn’t working with autistic children as a speech pathologist, she is busy studying aromatherapy. She also makes essential oil blends for her friends and family in the Hudson River Valley where she lives with her husband and three children. This post marks a new foray into perfume for this blog too, the first of many more to come. Many years ago, I worked with an eccentric woman who — aside from claiming to be psychic and descended from gypsies — was well-versed in the healing properties of essential oils. She insisted that sandalwood was “my oil” and gifted me a full ounce of pure Mysore sandalwood encased in an Egyptian-style bottle with a gold stopper. For those of you who might not know, Mysore sandalwood is like liquid gold: extremely rare and increasingly hard to come by! At the time, I was an eau de toilette-spraying sillage monster. The idea of dabbing sacred oil on my “third eye” was preposterous! After two years of collecting dust on my desk, I finally threw out the bottle. Flash forward twenty years later . . .
For the past six years, I have shared an office with a “perfume despising” co-worker. No matter how judiciously I apply, she makes comments like, “Your perfume reeks of old lady!” and “Open the windows NOW!” To add insult to injury, my husband bans perfume in our house every spring and fall, when my conventional perfumes exacerbate his allergies. In my attempt to inoffensively wear perfume on a daily basis, I began exploring essential oils. Nowadays, one of my favorite scents is New Caledonian sandalwood — which I wear straight up without any complaints from my co-worker or my husband. One day, I had another epiphany: what better way to further scent my environment on a daily basis than with aromatic teas? They offer up a dual sensory delight in taste and smell and are unobjectionable to those who have a problem with perfume. To me, drinking rooibos tea is like drinking sandalwood: it is a creamy, woody, caramel delight. Zhena’s Gypsy Chocolate Chai Rooibos Tea is blended with spices and dark chocolate. 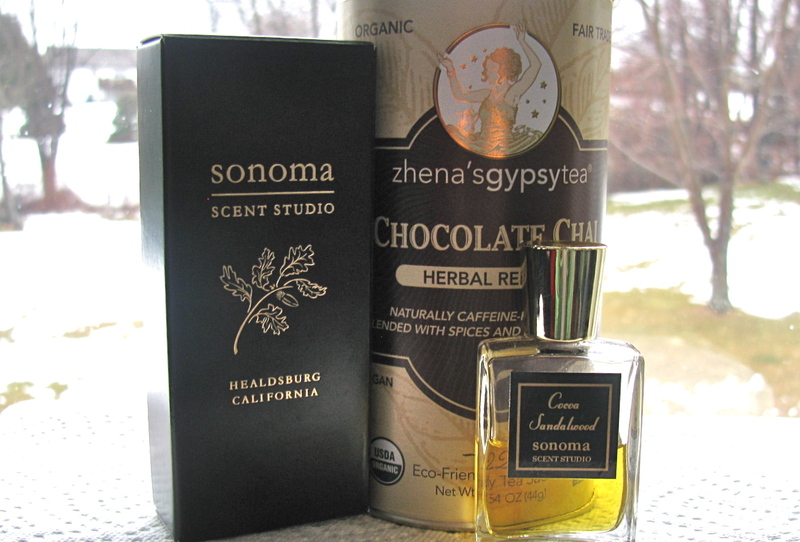 It is the perfect match for Sonoma Scent Studio’s latest release: Cocoa Sandalwood. Sonoma Scent Studio is an artisanal perfume company located in California. It is owned and operated by Laurie Erickson, the mastermind responsible for these high quality and affordable liquid masterpieces. I also especially love supporting Laurie. She is a kind and generous soul who makes an effort to stay very connected to her customers. She also maintains a terrific blog that you can check out here. Cocoa Sandalwood perfume contains generous amounts of New Caledonian sandalwood, natural peach lactones, spices and a deep, dark chocolate note. It is the quintessential grown-up gourmand scent and is truly a delicious olfactory delight. As it is all natural, it sits close to the skin. It also plays well with the “perfume-averse” crowd. In fact this is the only perfume that my husband allows me to wear to bed. One tiny drop on my wrist is all that I need for happy sniffing into a land of slumber. During these cold dreary days in the Northeast I wear my SSS Cocoa Sandalwood and drink my Gypsy Chocolate Chai Rooibos Tea whilst thinking about that zany woman twenty years ago. Eerily enough, many of the predictions she made about my future life did indeed come true. Giveaway: We would like to offer one lucky commenter the chance to win a 1ml sample of Sonoma Scent Studio Cocoa Sandalwood, accompanied by a sampler of aromatic teas, courtesy of Brie. This is a random draw open to only residents of the US due to tightened shipping restrictions on perfume. The draw will end this Sunday, March 3, at 11:59pm. To enter, leave a comment for us below! Cocoa Sandalwood Eau de Parfum is available directly from the Sonoma Scent Studio website in 4 sizes: 3ml ($15), 5ml ($25), 17ml ($64), and 34ml ($125). Zhena’s Gypsy Tea Chocolate Chai is available to purchase for $6.99 from their website. It can also be found at other outlets like Safeway, Whole Foods, and Central Market. Photo by Brie’s daughter, Brittany. Excellent post, brie! Lovely to see you here. Thank you, Birgit! I cannot believe it myself that I parted with that Mysore! However, to my nose New Caledonia sandalwood is equally as fantastic! I too got the willies when you said you threw that bottle away. I still have a partially full bottle of Mysore Sandalwood in a tin bottle from the Karnataka State Government that my friend bought for me in 1983. I am almost afraid to use it, because I know there is no more. But occasionally I will dab a drop on the crook of my elbow, and just drape my arm over my face and relax, deeply. I am absolutely looking forward to trying the Cocoa Sandalwood when Laurie puts her cart back up. Another sandalwood lover..hooray! Yes, you must give Cocoa Sandalwood a try…you won’t be disappointed! Hi! Ouch, that loss of Mysore Sandalwood is painful! Both the tea and Laurie’s’ perfume sound like a perfect late winter pick me up. Thank you for the draw. Hi ringthing! I know….all perfume lovers are probably gasping when they read this post :)! Indeed, the combination of this tea and perfume is so comforting during the cold season. Oh I love this new guest post feature! I know next to nothing about perfumes so I’m excited to learn more. Can I ask a silly question? What’s the difference between an essential oil and a perfume? Can you reccommend any websites that talk about the basics of perfume making? Thanks! Pure essential oils are made from plants, flowers.leave,.trees,roots, fruit rinds,etc-basically they come from nature and all have specific healing/health promoting properties. The original “perfumes” were made from pure essential oils. Nowadays, most of the commercial perfumes are made from synthetic materials to insure that they have lasting power and essentially smell the same on everyone. I enjoy wearing both (essential oils and conventional perfume) but my preference is for as natural as possible. I purchase most of my essential oils from Eden Botanicals. I would check out their website if you are interested in making natural perfumes from pure essential oils. I believe they have some recipes as well. Have fun creating! Thanks for the lovely comment and support! Isn’t Brie great? Beautifully put, Daisy! And this is true….natural perfumes made only with pure essential oils do take on a life of their own and impart a unique scent to each individual (unlike synthetic perfumes which usually smell the same on everyone). Mandy Aftel surely is an inspiration….I must have read her book Essence and Alchemy ten times within a one month time period. For sure there are great perfume recipes in that one! I’m not sure if I agree that regular old perfume smells the same on everyone . . . I actually find that skin chemistry has a big effect for any scent. I can think of a few that I find repellent on me, but completely different on other people. Maybe it’s not as dramatic of a difference for those perfumes that are a blend of the two . . . I just wanted to pop in and say thank you so much to Brie and Daisy for the post and draw! Also, on the topic of cooking/essential oils/Mandy Aftel, she has some chef’s essence oils that are meant to be used in cooking that look fun! Now that I think about it you are right in the sense that our perception of certain perfumes can vary depending upon the wearer. With essential oils, even the same type of oils can smell radically different depending on how/where they were harvested. So true! I agree: it seems like it is much easier to maintain consistency between batches with synthetics for obvious reasons! Thanks for that great suggestion…..I have been eyeballing those chef essence oils for a while now! Maybe Daisy can come up with a recipe for us which includes one of them 🙂 !!! I got some ideas 🙂 They all involve ice cream! Now we are talking! I LOVE ice cream! I am surprised that you have not come up with a bacon/ice cream combo 🙂 !! That pairing sounds fabulous. But oh, how sad about the sandalwood oil. It’s good to hear that there’s a suitable replacement for Miser. I love a couple drops of sandalwood oil in a hot bath. Thanks for a great post and inspiring tea/perfume combination. They sound just the thing for winter’s last gasp. I know…the mysore…such a tragedy! Nonetheless, I have found the perfect substitute in New Caledonia Sandalwood absolute. And a few drops in the bath sounds lovely! Sandalwood is such a grounding note which is why I love it:)! What a scrumptious way to start your first foray into the world of blogging! I love this almost synesthetic cohabitation of taste and smell in your mind – and would love to try the combination you so beautifully describe – I must wait however until I can get my hands (by hook or by crook) on some SSS scents here in Merrie Englande. I look forward to hearing more from you in the future – and I do hope at some point you are freer to wear more fragrance. Perhaps that intolerant colleague is a message on high to change job – I’m sure your delightful Sandalwood Savant would have had something to say on the matter. (PS as much as I would like to I can’t be entered into the drawer for reasons of geography). Why thank you so much! There is a definitive link for me between food/drink and perfume and since I am such a sensory seeker I enjoy both in great degrees 🙂 !!! No chance that I would leave my job but I have been rallying to get my own office….hopefully one of these days! If you can get your hands on any SSS scents do try them! They are truly magnificent! Oh an office move sounds like the perfect way forward! I shall be in the US later this year and will be trying SSS when there – meantimes the search for a UK stockist goes on. Have a perfectly perfumed day! Will you be passing through NYC? If you will, definitely let us know! What a wonderful giveaway! I’ve been dying to try that Cocoa Sandalwood scent, I’m a big fan of Sandalwood scents as they don’t agitate my migraines and Rooibus is a lovely alternative to caffeinated teas without sacrificing flavour. I am sorry to hear that you suffer from migraines 😦 ! A very close friend of mine does as well and I am very careful about my perfume choices when we get together. Same thing with my hubby. The conventional perfumes trigger migraines during allergy season. I think you would get on splendidly with Cocoa Sandalwood…as I said it sits close to the skin and I know from firsthand experience that it does not cause headaches for those who are sensitive to perfume. Agreed on the rooibus….a fantastic tea “sans caffeine”- and the one mentioned in this post is exceptionally flavorful! Thank you! In my mind perfume and aromatic teas are a match made in heaven! And you are so right….chocolate in both is the icing on the cake 🙂 !!! The chocolate chai is divine, and both together is to die for! Good luck in the draw! Rooibos is a very strengthening tea. Great combo. Indeed it is!! I will have to send you some 🙂 !!! Very nicely written. And that sounds like a perfect combination of scent and flavor. Thank you, Kathy! It really is a delightful combo…. Loved this post. Rooibos has been a favorite of mine since I visited South Africa many moons ago, and sandalwood is by far my favorite perfume note. I’ve been dying to try Cocoa Sandalwood! I love rooibos tea as well for it so much reminds me of sandalwood. That must have been quite an experience, a visit to South Africa! If you are a sandalwood lover I think you would really enjoy this fragrance. Hi brie! It’s so great to see you as a guest writer! I scowl every time I hear about your co-worker. I try really hard to be mindful of my surroundings but I’m not sure I’m a nice enough person to tolerate anything like that from anybody but the most close people. I’m glad you found some middle ground that allows you to enjoy your hobby without confrontation. Isn’t cocoa sandalwood the most perfect sleep scent? As far as my co-worker goes, I have resolved myself of the fact that her issues go way beyond my perfume wearing. Mean spirited individuals do not deserve our attention :)! But no worries, every once in a while I get passive aggressive and wear a fragrance that I know she won’t like (shame on me!). A heartfelt thank you for allowing me to post and enduring my severe lack of techno skills with kindness, patience and great advice! You are the best and I love this blog 🙂 !! Great post! It’s very cool that someone told you sandalwood was “your” oil. I have been trying to find a scent with a chocolate note without success. I do love sandalwood, so perhaps this could be the one! I don’t think a day has gone by in the past few years in which I didn’t include some dark chocolate and some kind of tea. I’ve been expanding my horizons by going to my local tea shop. They take the top off the can and fan it in my direction so I can take in each tea blend’s aroma. It’s a little hard to pick just one or two! Like perfume, it’s a wonderful journey to find your favorites! It really was amazing that she knew me better than I knew myself at the time 🙂 ! too bad I wasn’t listening for I would probably still have that Mysore! To my nose the chocolate in Cocoa Sandalwood is dark and rich (not overly sweet) so if that is what you are looking for in a chocolate fragrance I think you would really enjoy Cocoa Sandalwood. And I completely agree! Finding favorite perfumes and teas is indeed a fabulous journey! ..would love to try the pairing. All that is lacking is some homemade shortbread. Now we are talking! Aromatic tea, delicious shortbread and great perfume! I love the idea of enjoying a fragrance with a steaming infusion. That makes perfect sense! I roast my own (green) coffee beans, and the smell is intoxicating, intense, and much more complex than your typical Starbucks’ brew, and I could imagine that also pairing nicely with Cocoa Sandalwood. Love, too, Ms. Ericson’s fragrant artwork. I’m the proud owner of a bottle of her buttery-luscious Nostalgie, and am looking forward to this new deliciousness. Brilliant! Cocoa Sandalwood would go beautifully paired with that fantastic coffee you have mentioned! I like this idea 🙂 !!! I agree that Nostalgie is gorgeous! My teenage daughter and I are often at odds with our perfume choices but she immediately recognized the beauty of Nostalgie….one of these days I will be gifting her a full bottle! Ooh, lucky girl, your daughter! My 13-year-old is already a bit of fume-snob, at least compared to her classmates, who use teengirl equivalents of Axe, while she’s testing slightly more sophisticated scents. Brie, thanks for your generous draw. What a great way to spread the wealth, and spread the word. I’ll be on the lookout for Zhana teas at my local coop, and win-the-draw or not, I’m due for a sample of Laurie’s newest soon. Thank you 🙂 !!! And thanks for stopping by! Lovely post! Thank you very much for the drawing! Thank you for the lovely comment! You’re in! Good luck in the draw! I know Amer….that makes two of us!!! I should have been arrested for that one!